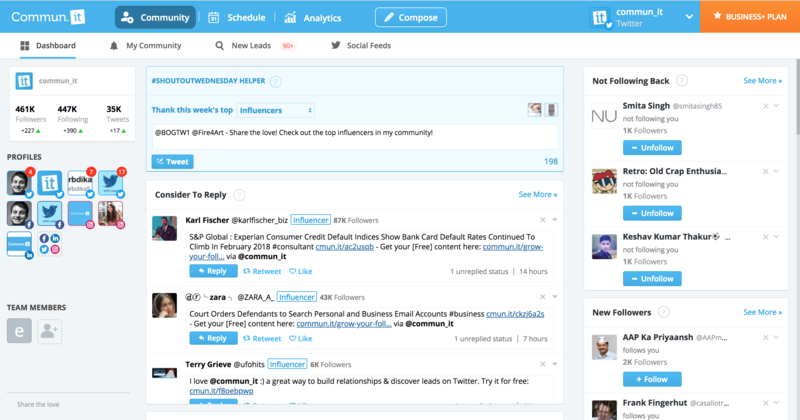 Commun.it is a great tool to manage and grow on all networks, but let's focus on Twitter for now. 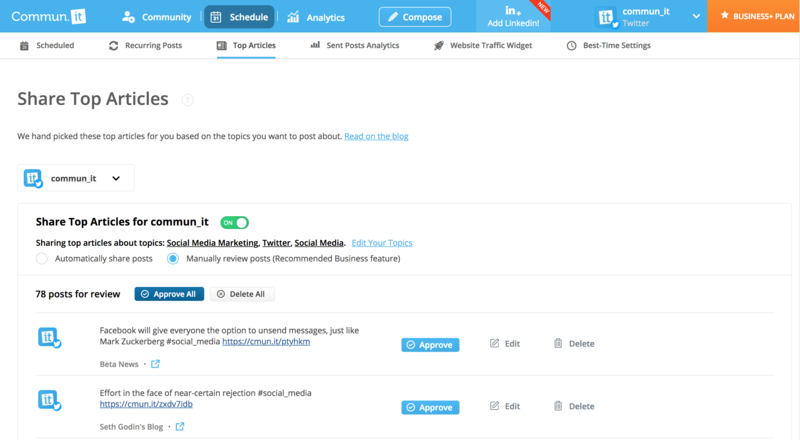 Here's an overview of all the many features in Commun.it, and how you can use them to reach your goals. 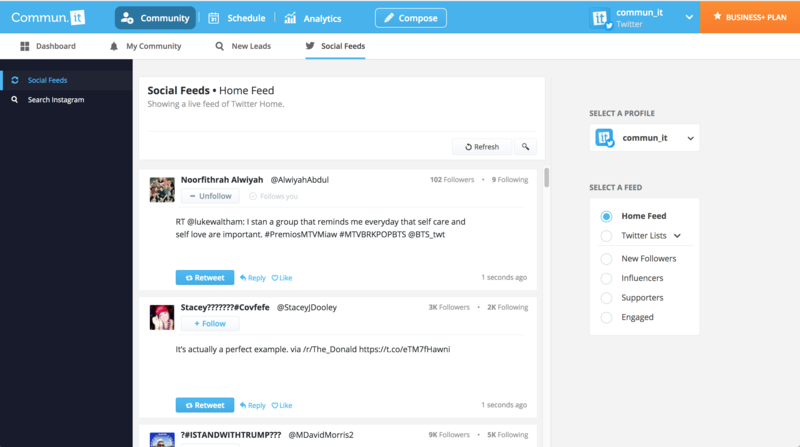 The Dashboard is the home base for each of your Twitter profiles you connect - and you connect all the profiles you manage. You'll find on this tab all of the actions you have to do every day to manage and grow your community. We've analyzed your community and already given you all the people you need to follow, unfollow, reply to, and engage today. Hover on the questino mark next to each title if you need an extra hand. The My Community tab is a more in-depth version of the Dashboard, giving you an opportunity to dive a bit deeper into all of the suggestions Commun.it has for you. 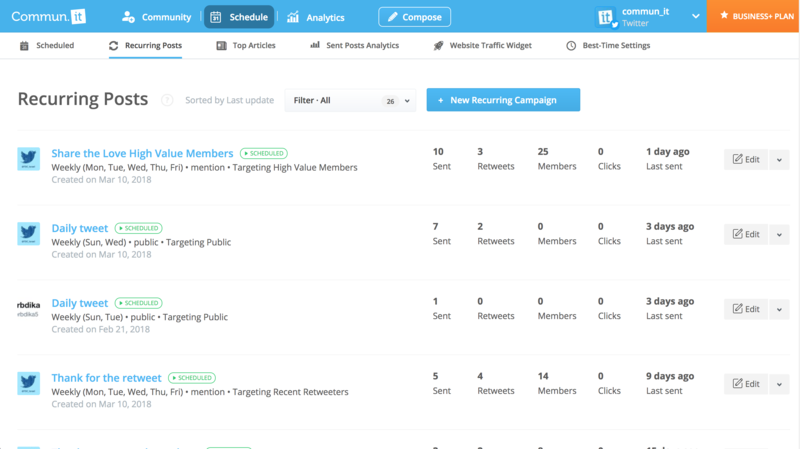 You'll find a lot of the same actions you see in the Dashboard, but now you have an opportunity to see more lists, more people to engage with, and more insights on your community. 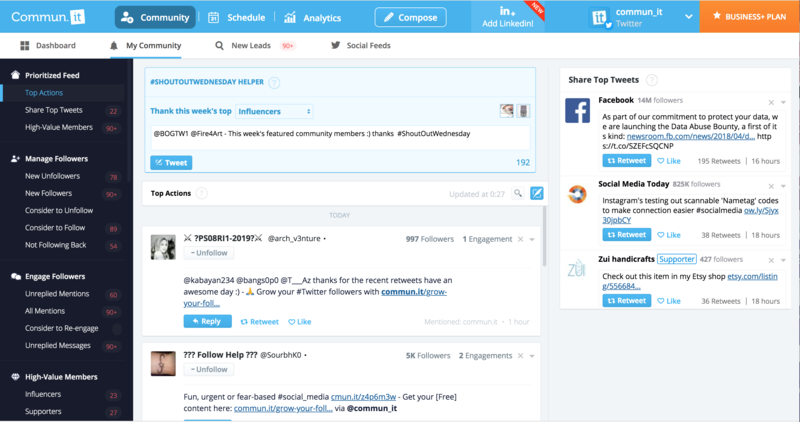 Social feeds are a great way to see your Twitter feed from right within the Commun.it dashboard. 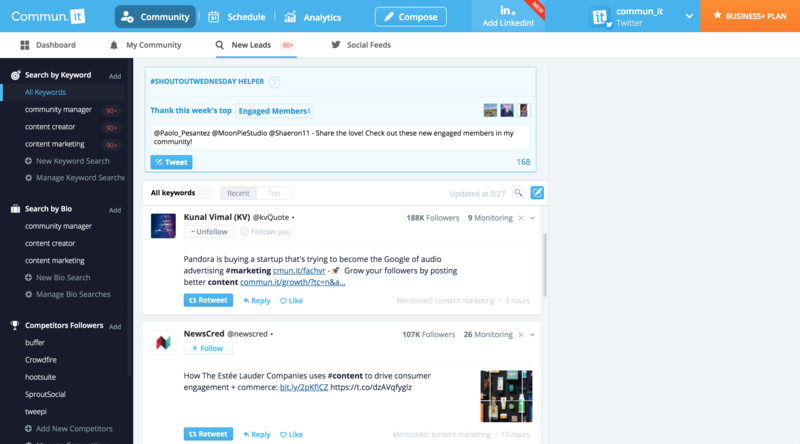 Even better - you can see different versions of your Twitter home feed, like filtering only posts from your High Value Members (influencers, supporters, engaged) or New Followers. You can also see posts from your Twitter lists here. Scheduling tweets in Commun.it is easy - from any reply, retweet or new tweet, you can choose when you want your tweet to go out. You can send tweets now, using 'Send Now' or schedule them for later. Choose 'Custom Time' to choose the exact time you want the post to go out , or choose 'Best Time' and we'll do the guessing for you. We calculate the Best Time for you to post to get the highest engagements and reach, and schedule them for you with one click. See all the posts you scheduled in the Scheduled Posts tab. You can still edit and delete posts before they go out using the buttons on the right side. 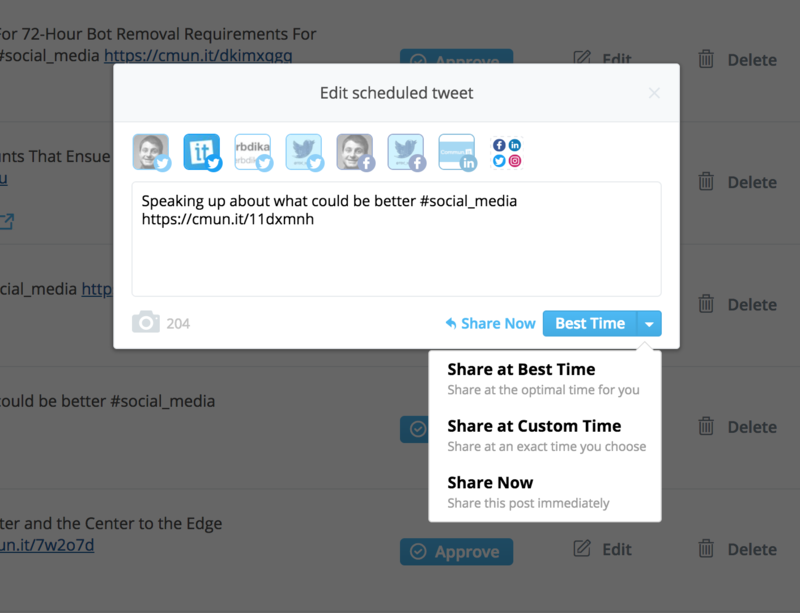 Recurring posts are smart tweets that are set to send out automatically for you. There are few types of recurring posts, each one targeting different members in your community. You can configure the posts here by clicking 'Edit', and also come back to see how they're performing by checking the stats on the right. 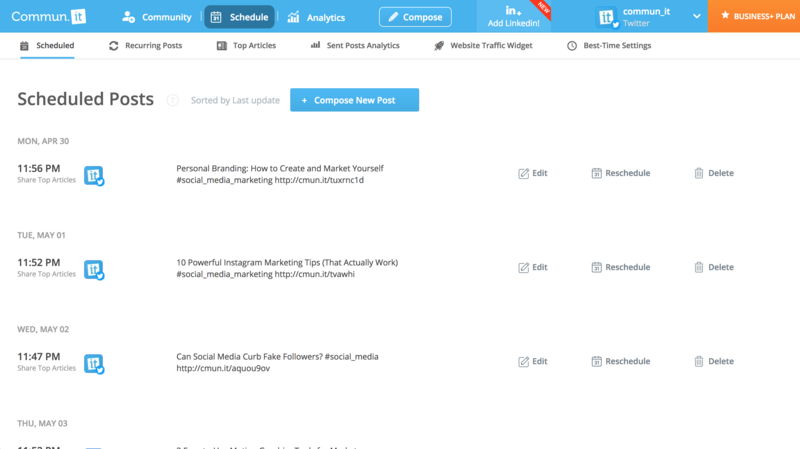 Recurring posts are automatically scheduled to go out, and they mention new people from your community each time, to keep your community engaged without lifting a finger. The Share Top Articles feature helps you find new articles and content to share based on the topics that interest you and your business. Edit Your Topics to choose the topics you'd like to share, and then choose whether you'd like the articles to go out automatically or manually. If you set this feature to 'Manual', we'll find new posts for you every day, and you just have to come and approve the ones you want to post. Easy as that! 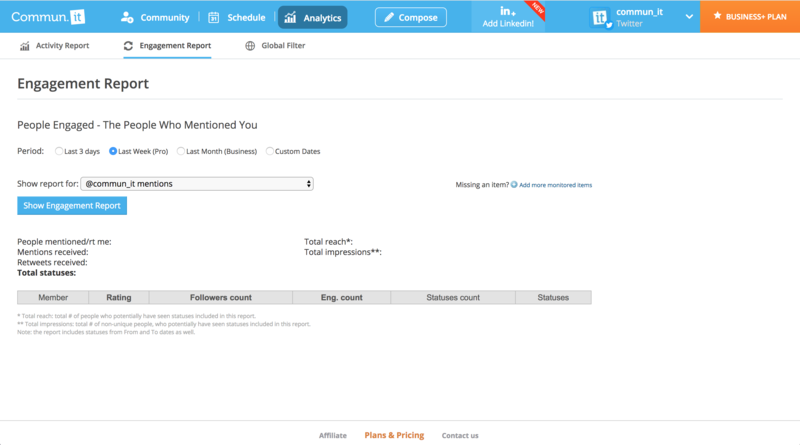 To check up on all the posts and content you've shared, use the Sent Posts Analytics tab to see how your posts are performing. Here you can see how many likes, retweets, and clicks you've gotten on each post, and also website traffic and purchases. 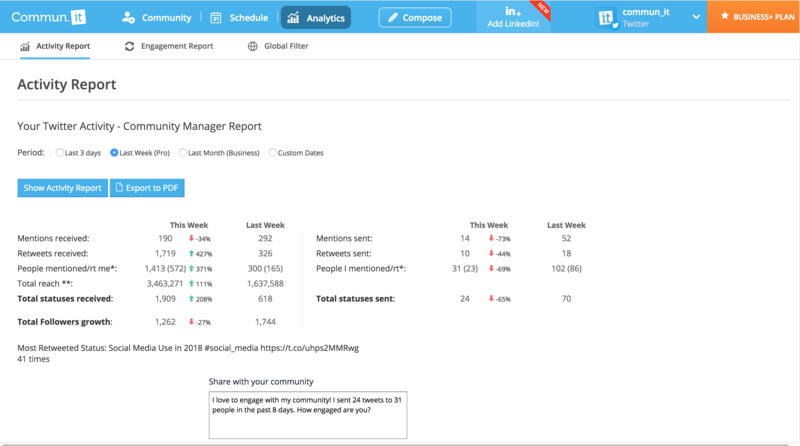 The Activity report helps you see how active you've been engaging your community, and how many engagements you've received and followers you've received in return. Use the selection at the top to decide which report you'd like to see: last 3 days, last week, last month, and click 'Show Activity Report' to generate a report. The left side shows the engagements you've received, and the right side shows your activity. 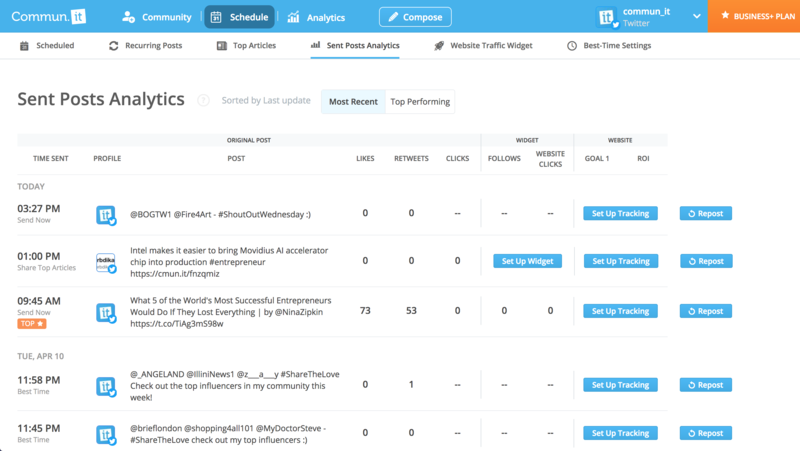 The engagement report helps you keep track of a certain hashtag or monitored item that you manage. For example if you did a hashtag campaign on Twitter, you can see everyone who mentioned that hashtag, how many times they mentioned it, and export them to CSV.